Last year my mom found a recipe for lemon bars in her People magazine (May 14, 2012 issue of People). The recipe was supplied by none other than news anchor Katie Couric formerly of the Today Show and CBS Evening news. Katie Couric would often make this dessert recipe for Mother's Day as a family tradition and my mom wanted me to make these lemon bars for her for Mother's Day as well. My first reaction was, "Since when was Katie Couric a chef?" 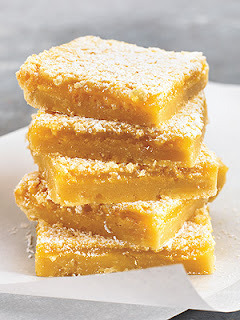 You see, mom loves her celebrity gossip and is enamored by celebrities in general which explains why she subscribes to People magazine and watches Extra and Access Hollywood, so when she saw that there was a lemon bar recipe endorsed by Katie Couric, then now she just had to have me make these for her as a dessert. Because it was Mother's Day, I obliged and made these lemon bars. I was pleasantly surprised that these lemon bars were easy to make and were quite good. I'm not even a lemon bar kind of a guy, but I found myself eating multiple squares because it was pretty good. The reason why it has taken me over a year to write this lemon bar post is because I plan to make these again for a pot luck at my work. I had totally forgotten about this recipe until now. I guess Katie Couric really does know what she's talking about on when she's on tv. Katie Couric, if you're reading this, I will never doubt you again. Lemon Bars fresh out of the oven! Don't be worried if your lemon bars seem rather gooey in the middle. I originally mistook this for it still being raw egg, but rest assured that that's the way it's supposed to be. When it cools, it'll begin to set, but don't be surprised if the lemon/egg mixture is soft right out of the oven. When sprinkling the confectioners' sugar on top of the lemon bars, I would use a small strainer which would help evenly distribute the sugar on top. Use of a strainer makes the sugar topping prettier when plating. You can always lessen the number of tablespoons of lemon juice if you don't want your lemon bars to be too lemony. If 6 tablespoons is way too much for your palate to handle, then use 4 tablespoons instead. I once used only 2 tablespoons and there was a subtle lemon flavor, but not enough of it since I mostly tasted the crust. I felt like the lemon flavor was lost and was not featured enough using this small amount of lemon juice. 1. Preheat oven to 350 degrees and lightly grease a 13x9 inch baking pan. 2. In a food processor, blend confectioners' sugar, 2 cups flour and salt. Add butter and pulse until mixture is crumbly. Press into pan and bake for 20 mins. 3. Meanwhile, beat eggs, 2 cups sugar, 6 tablespoons flour, and lemon juice until well combined. Stir in lemon zest. Pour on top of hot crust and bake for an additional 25 mins. 4. Let it cool and sprinkle with confectioners' sugar. Cut into squares.